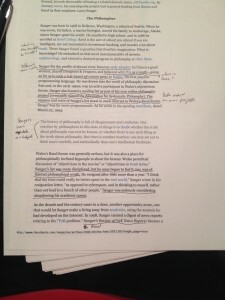 ENG 110 O – Summer 2014 | English Composition with Michael J. Cripps, Ph.D.
Paper 2 is due tonight. Cripps will at his computer, online, and available for conferencing from 10:30-2:30PM on Monday. To conference, send an email, invite him to a hangout through Google +, or give a call at 207-602-2908. This week’s issue of Wired.com has an interesting article on Google’s retail delivery service, a possible new competitor to Amazon’s wildly successful business model. “With New Overnight Delivery, Google Confirms That It Wants to Be Amazon” reports on Google’s pilot same day (yes, same day!) delivery in parts of California. Apparently, Google is about to expand that with a next day service as a full frontal assault on Amazon’s efforts. This only merits mention in our course because Amazon apparently uses a hierarchical distribution model that runs out of massive warehouses. Google’s model, on the other hand, is decidedly decentralized and network-based. And we thought the question of top-down, bottom-up, hierarchy, and network only applied to arcane articles by strange people we don’t know. Find it interesting? Post a comment. We struggled a bit with the Google Hangouts last week. Apollo had only one member show; Dionysus had two people show, but one member dropped off in the first 1/3 of the conversation. As with last week, I’ll initiate a Hangout just before our start time. If you’re logged into your Google account and on Google+, you should see the invitation. We will attempt a writing group video conference for each of our writing groups, Apollo and Dionysus. I’ll initiate a Google Hangout with the members of the group. Members should get that invitation by being logged into their Google accounts. I think this will be most obvious if you’re on Google+. Look for that invitation sometime just before the appointed Hangout time. I’ll plan for us to talk through some paragraphs from the papers. I’m prepared to take the lead and identify paragraphs, but I’d really appreciate it if writing group members came with a question or two about a paragraph from their papers. It’s pretty easy to share and talk through a Google Doc in a Hangout, so we’ll try this approach. Full disclosure: I have tested Hangouts with family members to confirm that we can do what I want to do with our time. But I have never used a Hangout with a class. In today’s The New York Times, David Carr writes about Medium.com, the web publishing tool we will be using to publish our papers to the web. We’ll also serve as editors for collections we’ll build on Medium. The article, “A Platform and Blogging Tool, Medium Charms Writers,” is freely available on The New York Times website. This is a reasonably good article that captures some of the goals of Medium‘s founder, Evan Williams, and a sense of where Medium sits in the online publishing environment. Williams was a creator of Blogger, one of the venerable blog platforms that got snatched up by Google back around 2001, and he co-founded Twitter. Given his track record, it’s hard not to imagine that you may be working in a tool that will be one of the “next big things” in a couple years. 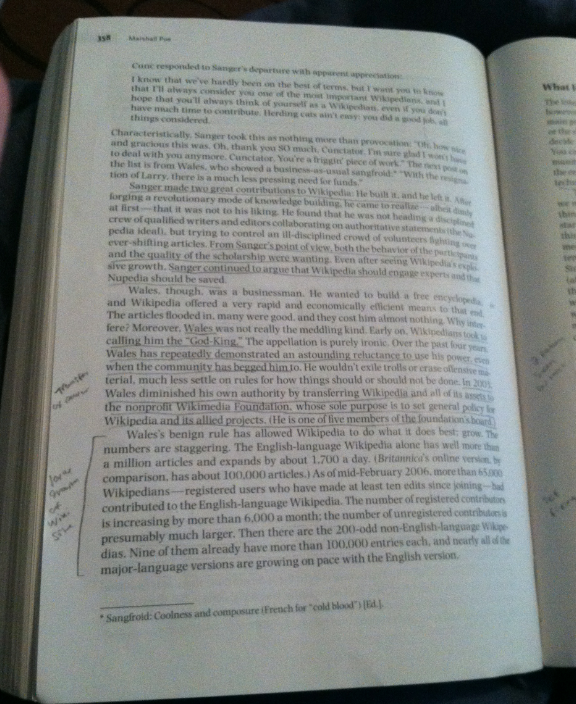 For my annotations, I prefer to stick to highlighting. I use the different colors to indicate different parts of the reading. 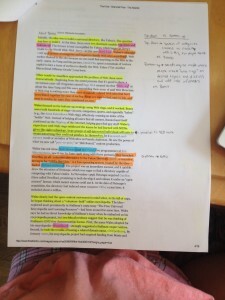 Blue indicates an important person, pink indicates an important word, orange indicates the description of these words/people, and yellow is facts that I find important in the reading. 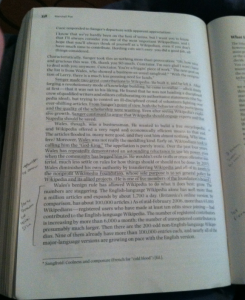 On the side I write down facts in the reading that I consider important, as well as point out ideas or make comparisons. This can be seen above with my definitions comparing top-down and bottom-up models as well as underlining a sentence that I feel relates to the TED talk video. I have almost everyone’s conferencing availability, at least to the extent that we can tell our schedules at this point. Based on what I have, I’m proposing the following writing groups. First Step: Head over to the Students page (top navigation) and check out your peers. Consider this our “introduction” to each other. And, in a grand experiment for me this summer, we’ll attempt one weekly, 45-minute group video conference via Google Hangouts. Post a confirmation to indicate whether this can work for you. 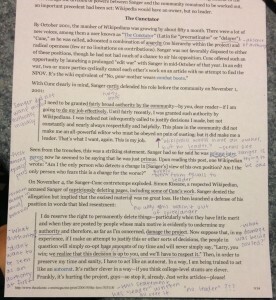 Annotating is something that I have never really done when reading by myself mostly something that I have done in class when a teacher has told the class what to highlight. At first I didn’t really like doing it because I felt like I was questioning myself with what I was doing. I think the best thing for me was to just look at things that I questioned or didn’t understand and put notes down and think about those notes later on. I feel like this is something that I have to keep working on because it is new to me. 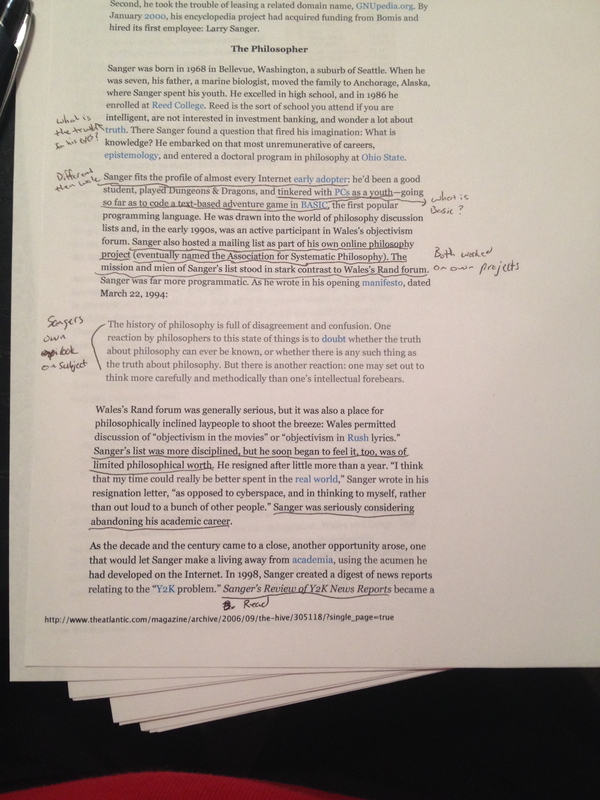 Annotating a reading in this way is something that I have always done to an extent. If the reading is something that I need to really comprehend and do further work and thinking on then I will likely take notes and ask myself questions along the way. 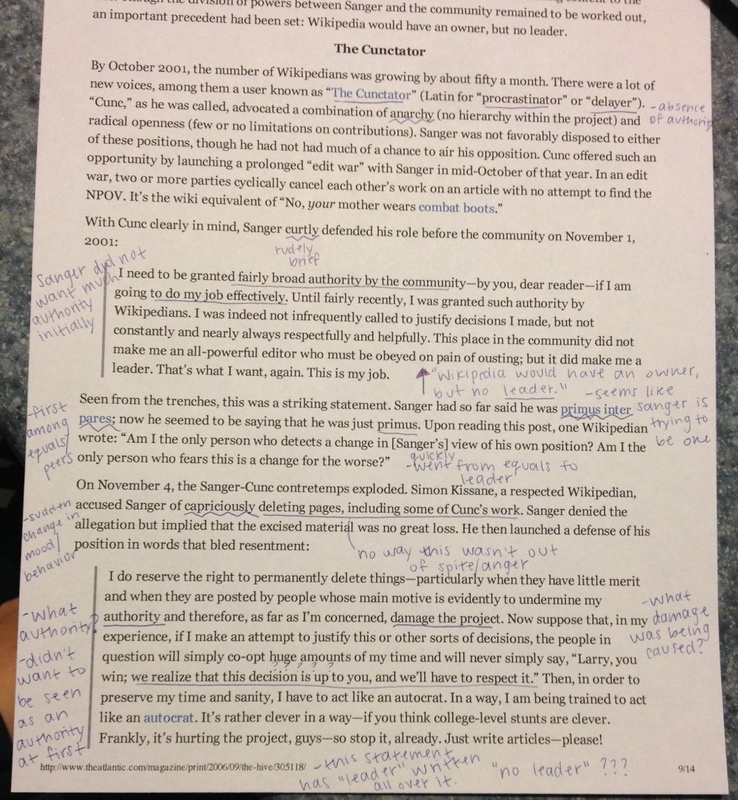 This is something that really helps me to be able to further understand the subject that I am reading and it also helps me when I need to revisit the material and I can quickly glance over the notes that I made and remember what the author was saying at any point throughout the reading. English Composition with Michael J. Cripps, Ph.D.